We have discovered that there is a big difference between wall miles and walked miles. Take yesterday for example, with our 12 mile walk from Humshaugh to the Twice Brewed Inn. When the Romans built the wall they placed a mile castle at every mile and two turrets spaced evenly between every pair of mile castles. That is the basis for wall miles. Actual walked miles are considerably different. There are detours around obstacles. A lot of the walking is through farm fields that don’t follow the wall path. There are detours caused by large mean looking animals and by avoiding Military Road, an extremely busy and narrow road. We often walk miles out of the way to see interesting landmarks and public toilets. Yesterday we experienced the added walking length due to elevation changes. We crossed seven crags in short distance that added strong up and down components to the walk. There is also the added walking length at the beginning and end of each walk. Inns are rarely on the wall path. 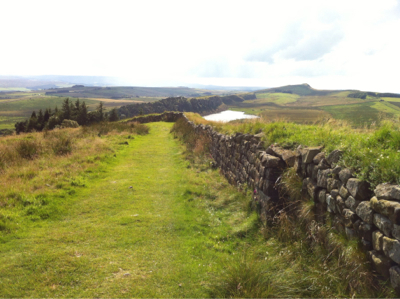 Yesterday we walked a mile from Humshaugh to the wall path and another mile from the path to the Twice Brewed. I figure that in our 12 mile wall walk yesterday we actually walked 16 miles, 12 as the crow flies. The good news is that, at the half-way point we are thoroughly enjoying the walk. The scenery is incredible, the pace unhurried and the physical challenges manageable. No walking today, a day of rest. 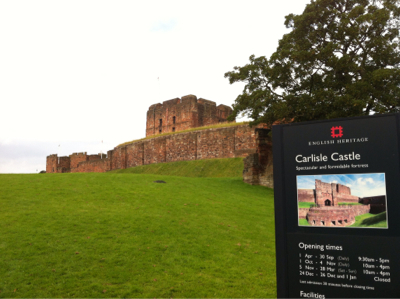 We took the bus into Carlisle and toured the castle. It started as a Roman fort and changed hands several times between England and the Scots, now belonging to England. More walking tomorrow. 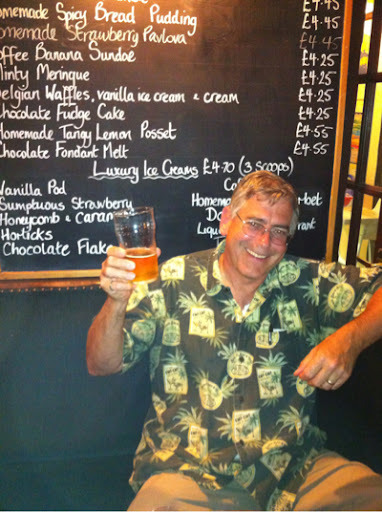 As always, even on a day of rest, I’ll have a pint for you!